need some advice on a chain and sprocket set up for my 09 wr250x. mostly 80% on road in the twisties and hills of WV... 10% on the interstate 70mph... and 10% offroad or mountain logging roads/well access roads. could i use factory 13t front, factory chain, and 47 tooth rear? if i 'NEED' a chain.... could i do 13t front, 47t rear with a 112 length chain? would it be better to do a 12t front, 45t rear.. and same questions could i used stock chain? or if i must change chain should i use a 112 length? is the 12t/45t close to the same ratio as a 13t/47t? bike is completely stock performance wise and has 3100 miles. Your going to need to lenghten the stock chain to run either combo so stick with the 13 in the front. 12/44 is the lowest you can get with the stock chain, any bigger in the rear and the chains too short. You can figure out the ratios on a calculator and see that 12/45 and 13/47 are kinda close. On my 2008 WR-250R, I used 12/45 sprockets with the stock chain - it barely fit, but I was able to get enough chain slack with the wheel completely forward. When I buy sprockets that aren't the stock ratios, I simply buy a chain more than long enough and shorten it as required. A grinding wheel or cutting wheel and a hammer and punch make it an easy job. In fact, some brands and models of chains give you a choice of either 110 links or 120 links with nothing in between, so having to shorten to the proper length is common. 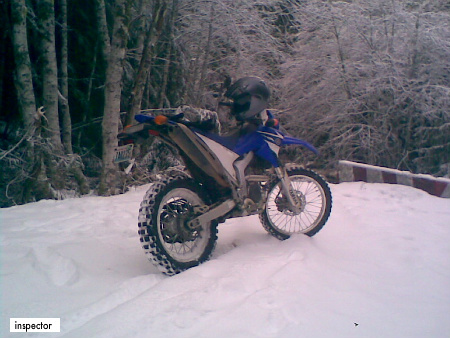 As for what ratio, on my 2008 WR-250X I liked 13/49. Felt perfect for the bike, and the bike still hit 80mph. 12/45 sprockets = a ratio of 3.75 (simply divide 45 by 12). 12/45 is a little lower, and 13/47 is a little taller. I run 14/49, so about the same as if you went with 13/46. Has worked very well for my 50/50 dual sporting, under conditions somewhat like what you're describing. It will do 70 mph just fine for as long as you need to do that to get where you're going. Given the choice of smaller or larger countershaft sprockets, I prefer larger to smaller, as long as I can achieve the gear ratio I'm aiming for. Quite happy to ditch the 12 and 13 tooth jobs in favour of the 14 tooth. I am planning to put a larger rear sprocket (49 or 50) on my WRR and wonder if I need to make any mods to the chair guides (there doesn't seem to be much room left in the lower rear one now). I am running 12-45 now and want a similar ratio but with the 13 tooth front since I am concerned by the reports of the chain eating into the swingarm. Please post up your experience with any modifications necessary to run such a large rear sprocket. i ended up going with 12t front 42 (stock) rear for a little bit. didnt like the chain noise from the 12t caused so i went to 13t front and 47 rear with a 112 link rear chain. i like it a lot but wish i would've gone with 48 or even 49t rear sprocket. still do about 50/50 on road offroad. the lower gear would be nice offroad and would still have plenty of gear to go 60/70mph. On my 2008 WR-250X, I ran 13/49 sprockets. No mods needed to the chain guide. The bike felt very good with those sprockets, too. Excellent! Thanks for the prompt and helpful reply YZEtc. Just what I needed to know. 14/43 - 108 chain for long distance trips (>3000 miles).